2014 USA BMX Grands Track Layout Revealed! 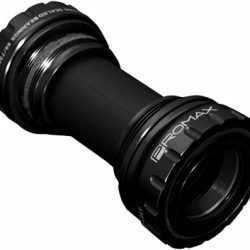 Now that the final regular stop of the 2014 USA BMX National series is in the books, all eyes, ears and typing fingers turn to the 2014 Grand National, just 32 days away. 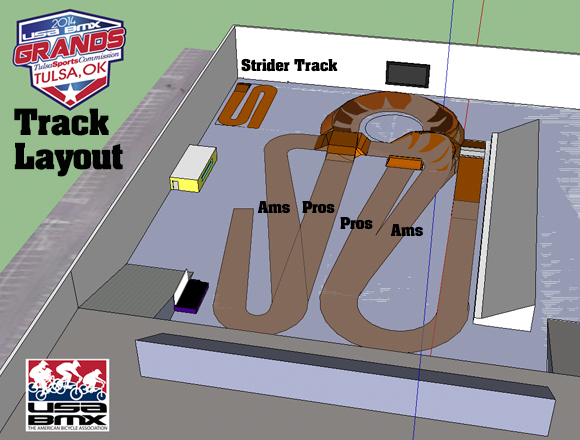 To start off the month-long countdown to the season-end battle in Tulsa town, USA BMX is starting it off with a big nugget–the rough layout for the track. We don’t have a lot of details just yet, such as where the jumps will be or what type–that stuff is usually decided closer to the race, and sometimes not until they guys get busy on the build, and start rustlin the Oklahoma clay and tossing around ideas. We do know that the track length will be roughly the same as last year–~1050 feet, so that is one input you can feed into your training calculator for the final month leading up to the Greatest Race on Earth. The track will have an amateur and a pro side on the second straight, complete with berm jump. The AAs will cross the amateur second turn on their way into the third straight, over what is being called a “Dothan Crossover,” named for the signature feature at Circle City BMX in Alabama. AA Pros and ams will each have their own third straight rhythm sections as well. Calling it an “am” side is really for convenience only, since the A-Pro, Vet Pro and Pro Women classes will all use the “am” side as well. So, no disrespect mean to those pro classes. The crossovers shut down the idea of a “decision maker” for the more air-hungry ams–everyone stays on their own side. USA BMX chief track builder, Billy Allen gave some tidbits on the third straight, saying “I’d like to end it with some pretty big jumps. We’ll probably use the off-camber centers between the jumps, like we did last year. 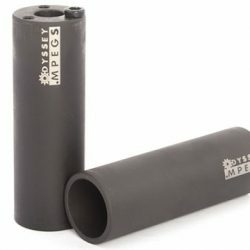 That worked well for preventing any inside-line advantage.” Looks like there will be some prime real estate for photo-gettin on that layout, and we are already training up our shutter finger and crouch-down muscle groups so we can get low while you’re goin’ fast.